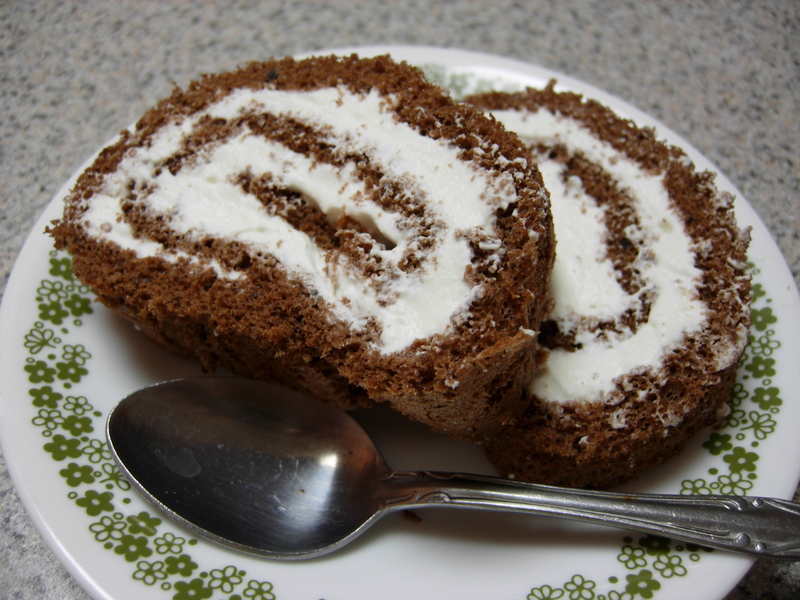 You probably know of this common cake by its British name: the swiss roll. The French refer to it as a roulade (which I think is prettier). 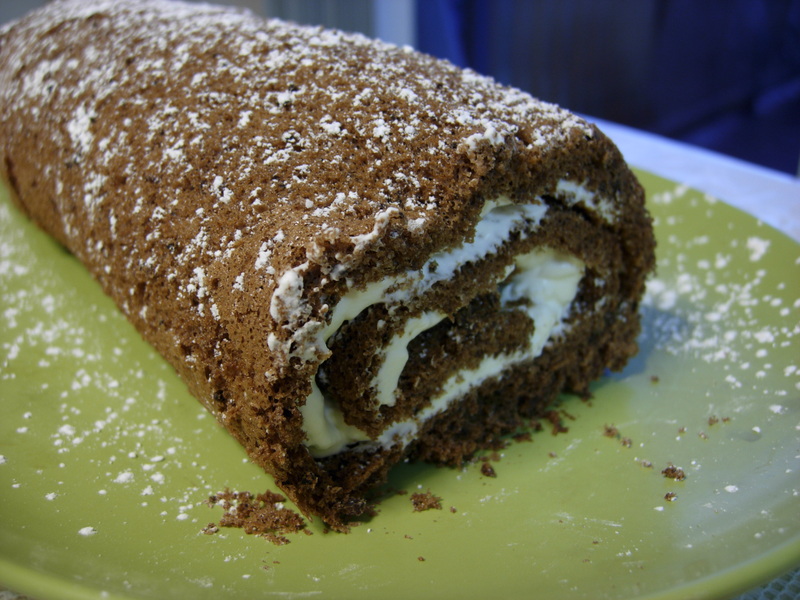 I was browsing through some recipes when the chocolate roulade, a chocolate sponge cake with whipped cream rolled up inside, struck a chord with me. I could taste the bittersweet flavor of real chocolate paired with the rich and light freshly whipped cream, and I was completely craving this combination. In the past I've tried to make strawberry cream swiss rolls, but to no avail, because my cake layer would always be too hard to roll up. It would crack and break as soon as I tried to wrestle with it. But I wasn't ready to completely give up hope of making a simple but pretty cake like the roulade. In my new recipe, I learned that you have to roll up the cake while it's still hot, and let it cool while it's rolled up, which prevents it from splitting and cracking in the final rolling with filling. Of course, I had my share of silly mishaps in making this recipe, but certainly the end product was fantastic. And I just adore the fact that the recipe is actually very easy to make. Every bit the distinct chocolate flavor, with the contrasting creaminess of the filling. It's no wonder that chocolate and cream is such a popular pairing in desserts! 1. Let eggs warm up to room temperature before starting. In the meanwhile, preheat oven to 400 degrees F, and grease a jelly roll pan (flat pan with dimensions of 11"x17", or substitute for different sizes as desired). Place parchment paper on top of the greased pan, and grease the paper as well. This step is important if you want to be able to release the cake easily after it is done baking. 2. In a bowl, combine the eggs and the granulated sugar. 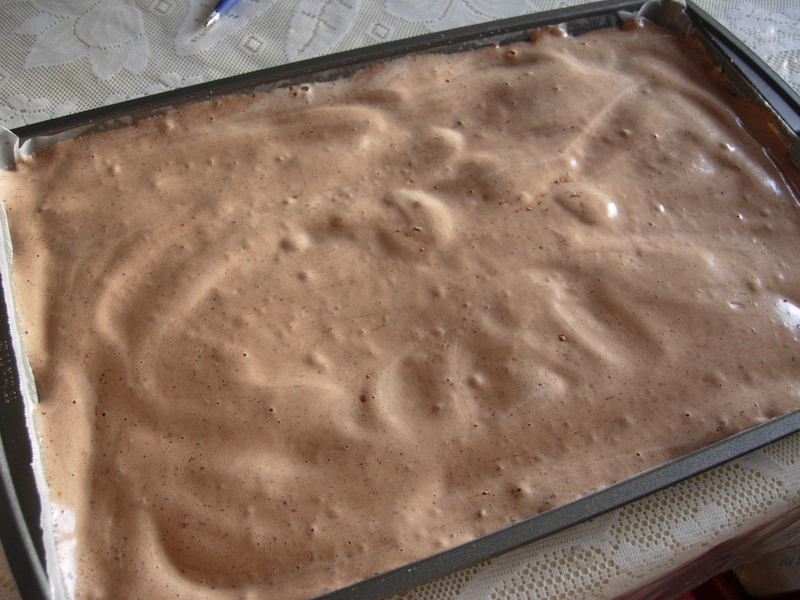 Beat with an electric beater on medium/medium-high until the mixture is thick and pale (several minutes). 3. Sift together the cocoa powder and the flour. Gently fold dry mixture into the beaten egg mixture until just incorporated. 4. Spread batter in an even layer into the jelly roll pan. Bake for 10-12 minutes, or until just set and the top is springy to the touch. While the cake is baking, place a clean kitchen towel on the counter and place a piece of wax paper on top. Sprinkle paper with confectioner's sugar. 5. Remove cake from oven, and immediately turn onto the paper and towel setup. Quickly remove the paper baking on the cake, and then using a serrated knife, trim off the edges of the cake that are crispy. 6. Next, using the towel as a guide, roll up the cake from the narrow side, rolling the bottom piece of wax paper into the cake roll. Let sit with the seam side down to cool for 5 minutes. Then carefully unroll and leave to sit while you make the filling. 7. To make the filling, simply whip up the heavy cream along with the 1 tbsp of powdered sugar and the vanilla. 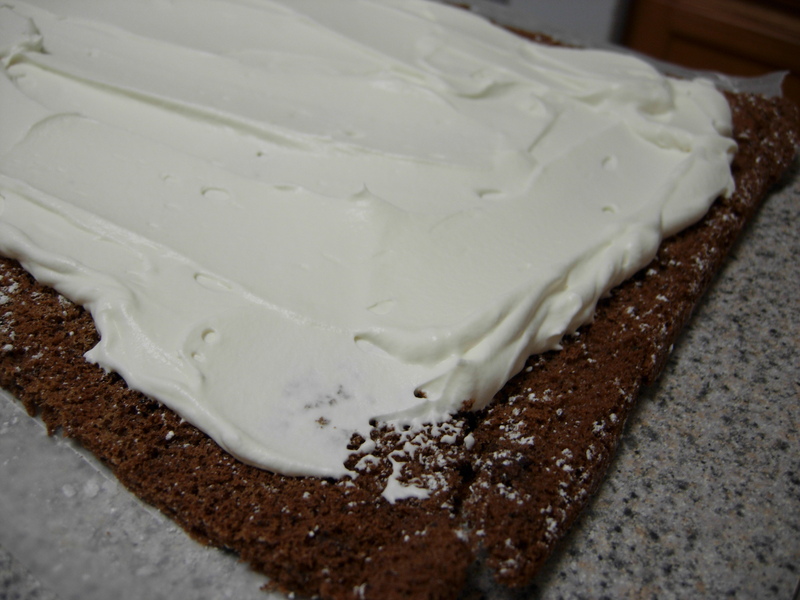 When whipped cream becomes thick, spread it onto the inside of the cake, leaving about 1 inch of space at the top and bottom, and 1/2 inch on the sides. This entry was posted on Sunday, November 25th, 2007 at 4:07 am	and posted in baking, desserts, French, Uncategorized. You can follow any responses to this entry through the RSS 2.0 feed.